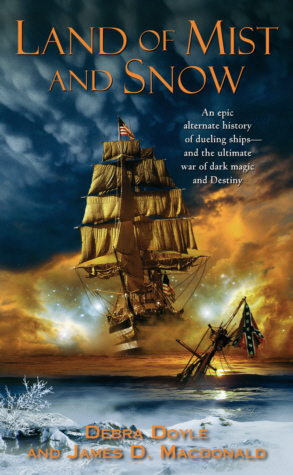 An epic alternate history of dueling ships — and the ultimate war of dark magic and destiny. Called to duty at last, Lieutenant John Nevis faces his assignment with trepidation. Boarding the USS Nicodemus — a sloop of war built in a single night — Nevis wonders uneasily at its strange aura of power, its cannonballs of virgin brass . . . and its uncanny ability to glide swiftly through the waters without steam or sail. As great armies clash ashore, the mission of Lieutenant Nevis and the Nicodemus crew is shrouded in an impenetrable gray mist of magic and malevolence. For a fearsome adversary awaits on roiling waves — an awesomely powerful vessel fueled by cruelty and terror; a demon raider driven by an insatiable lust . . . for blood. In late January of 1863 I was an idler; assigned to the War Department office at 88 Whitehall Street in the city of New York after my ship, USS Tisdale, burned when the Rebels took Norfolk. Time weighed heavily upon me. The war, which some had at first expected to be over in a matter of weeks — or a few months at most — would soon be entering its third year, and I could not fail to perceive that matters stood at a most perilous juncture. In the west, the free movement of our forces up and down the Mississippi still broke upon the rock that was Confederate-held Vicksburg; to the east and south, in the Atlantic and the Gulf of Mexico, Rebel commerce raiders and blockade runners ranged freely. Everywhere, my brother officers were gaining rank and experiencing sea-time, whether in gunboats on the inland waterways or in more conventional warships on the open seas, maintaining the blockade and chasing Confederate raiders. Meanwhile, I sat filing papers in an obscure office. President Lincoln had freed all the slaves in Rebel territory. My daily hope was that some similar edict would arrive to free me from my own labors. From my window overlooking the harbor, I could watch the Navy’s vessels come and go — a species of keen torture, since I feared that such a long period of shore duty would see my career stalled, if not derailed entirely, the ultimate goal of command at sea forever placed beyond my reach. So it was that on the morning of January 31st a messenger found me laboring at my desk, checking one long bureaucratic list against another. He had an envelope from the Navy Department in his hand, with my name on the front. I fairly tore the envelope from his grasp and opened it. What it contained was indeed the answer to my nightly prayer. I was detached immediately from my current assignment and ordered to travel by fastest available means to the Naval Arsenal at Watervliet. There I was to inspect and take possession of a dozen ten-inch Rodman guns, thence to accompany them to the place where USS Nicodemus might lie, in order to take my position as head of her gunnery department. Nicodemus was new construction; I would be a plank owner. I was further informed that Nicodemus was even then being fitted out in preparation for her sea trials. The remainder of the morning I spent in checking out of my temporary billet, drawing my health and pay records, and turning over my responsibilities to a hapless civilian clerk. I had been staying at a hotel under per diem. I lost no time in packing, and the afternoon saw me at the Hudson River Railroad station in my dress blue uniform, purchasing a ticket to Albany. It was long past dark by the time a hired carriage deposited me at the gates of the arsenal. A Marine guard directed me to the duty officer, who saw to my placement in the bachelor officers’ quarters. There I said my prayers and went to sleep, wondering what kind of craft Nicodemus might be. I had not heard of her before, though in an eddying backwater such as my office at Whitehall Street that would not be a surprise. Still, a sloop of war mounting a broadside of six Rodmans and, I supposed, lesser pieces besides, would be sufficient. I was well satisfied with my prospects. Morning found me in the Arsenal commander’s office, presenting my compliments and my orders. The commander, a pleasant enough fellow named Winchell who had preceded me by two years at the Academy, greeted me and offered to accompany me himself on my inspection tour of the guns. I felt it was hardly my place to refuse, and I was just as glad to talk again with a sailor; my previous tour had placed me among civilians and invalided Army men, landsmen all. As it turned out, he wanted to do more than talk of mutual acquaintances while showing off his command to an outsider. He wanted to pump me for information, information that I sadly lacked, and which baffled me as well. The guns stood in a burnished rank, gleaming the yellow-gold of brass. The petty officer strode over and presented his leader with a sheaf of paper, which he reviewed, then handed to me. It was the casting history of each of the Rodmans, from the first smelting of the copper and zinc to the present. I checked over the cannon carefully. I was no stranger to ordnance; the lives of myself and my shipmates, not to mention the defeat of our enemies, were dependent on the flawless construction and operation of the cannon. I requested an inspection mirror and a light, and examined every inch of the barrels, inside and out. They did in fact appear to be without scratch, crack, or other imperfection. I turned to Winchell at length. “You can be proud of your work,” I said. “Do you wish to examine the ammunition as well?” he inquired. “To the same specifications?” said I. “I can’t believe it will be necessary to handle each ball,” I said, which brought a smile to his lips. Winchell gave orders that the cannon were to be crated and loaded on a barge for transport. He then invited me to join him for a belated lunch. I accepted with pleasure. Over cigars at the officers’ club, I made bold to breach the question directly. Across the river in Manhattan I had not heard of a ship under construction that required brass cannon. I asked Winchell directly if he had ever heard of such a vessel. He kindly walked me to the barge at quayside where my dozen Rodmans, neatly crated, now lay side by side on a barge. Crates that I supposed contained brass shot filled a second barge. We shook hands, saluted, and I presented my orders to the master of the civilian tug that was to take me down the same river that I had only lately ascended. The pilothouse of the tug was cramped, and the smell of the engines pervasive, but I eagerly accepted the offer to make the journey there. A brisk wind was blowing, adding its bite to the winter air, while the sun dipped toward the western hills. A young enlisted man brought my seabag from my quarters on shore and laid it on the fantail of the tug, lashed to the rail. Towing hawsers were made fast to the barges, and with our whistles screaming out we made way down river. The sun set as we steamed along, the lighthouses of the Hudson illuminated, as we made our way to the East River of Manhattan and to the Navy Yard on its eastern shore. We came alongside a brig, TRIUMPH lettered on her sternboard in gold leaf, where we were evidently expected. The watch soon appeared with a lantern, a ladder dropped to our deck, and a working party swung out booms to load the cargo from the barge to the brig’s hold. I clambered up the ladder, my boat cloak swirling around me, to salute the quarterdeck and the officer of the deck. The degree of activity surprised me, and I said as much. I had expected the guns to be loaded at first light, no sooner, for the night was a dark and a bitter one. He concluded reading my orders by the binnacle lamp, then handed them back to me and instructed the messenger of the watch to take me below and show me to the captain’s quarters, then to my own. The captain, as it turned out, was “Uncle Joe” Suffern, of whom I had heard good report. He was a seaman’s seaman, and a fighting captain. Why he was assigned to such a small vessel and such an insignificant role as running coastwise cargo I could not at that time imagine. Our conversation was interrupted by a messenger who announced the loading complete and the cargo made fast for sea. Captain Suffern excused himself, directed the boy to show me to my cabin, and took to the deck. I followed the messenger toward the waist, where I was to be placed in a cabin shared with another lieutenant. My seabag was already there, lying on the deck beside a stanchion. I traded my boat cloak for a short jacket of thick wool and ascended the ladder to the main deck. The boatswain piped single up all lines, and the crew, well drilled, hurried silently to obey. “Cast off,” came a voice from the quarterdeck, and the line-handling party on the pier dropped the mooring lines from the bollards. The same tug that had carried the guns from Watervliet pulled us stern first into the stream, then cast off. We hoisted sail, and beneath topgallants and the glittering stars we passed beneath the Battery. I could see the War Department building, one window on the top floor illuminated by the lantern of a late worker. I imagined that it might be my relief burning the midnight oil, and raised my hat to him as we passed. As we entered the Narrows the word was passed to make full sail, and the little brig fairly bounded forward under a fresh breeze. By sunrise we were out of sight of land, the ship’s head east by north, shaping a course for who knew where.